In recent weeks at Ento HQ, we’ve identified a bit of an issue. Our team is growing. Fast. Now, that in and of itself is not a problem. Growth is generally considered a positive thing, and as a team, we’re all excited that Ento is moving ahead in leaps and bounds. However, when a team grows suddenly, how can you ensure the culture you’ve built (albeit accidentally) can grow with you? At Ento, that’s the challenge we’re facing over the next few months. Our plan is to take on four new developers (find out more here), which means by mid-2016, our team will have grown by 200% in 12 months. There are more than a handful of tales of businesses that have grown stratospherically, then been hoisted on the petard that is their own, poorly managed culture. The most publicised example of this in the past year has been Zenefits, which went from an aspirational tale to a cautionary one in just months. In a bid to avoid the pitfalls of startups everywhere that shine brightly for a brief period, then fizzle out, we’ve made a concerted effort over the past few weeks to document our existing culture, and create a framework that will – hopefully – grow with us as the business expands. In a bid to be completely transparent about what we’re about and how we do things, we’ve documented every aspect of the process along the way. We want to share what works and what doesn’t with other businesses experiencing the same growing pains as us. All too often, organisations take an ‘if it ain’t broke, don’t fix it’ approach to workplace culture. If nothing’s glaringly problematic, why go to the trouble of overhauling it? Luckily, at Ento, we’re not exactly in the habit of resting on our laurels. And rather than put culture on the backburner until things go south, we knew that taking a more proactive approach would pay off in spades in the future. Once we had a sense of what, exactly, we hoped to achieve, we were able to outline a process to do just that. We had a lot of of discussion in the office, about the best way to start tackling this issue. After all, how do you begin to define something that is, ostensibly, intangible and amorphous? The very first thing we needed to do was ask one very important question. Here’s something we agreed on from the very outset of this process – our culture and values were never going to be defined by just one or two people in the business. It was imperative, from the get-go, that every single person at Ento got an opportunity to tell us what was important to them. What are 3 words you feel represent (or should represent) Ento? What are a couple of core values you feel Ento should uphold? We gave the team a week to come back with their responses. What they came back with gave us great insight into what our team values the most, and the direction Ento needs to go in if we want to retain the great talent we already have. So what kind of responses did we get? 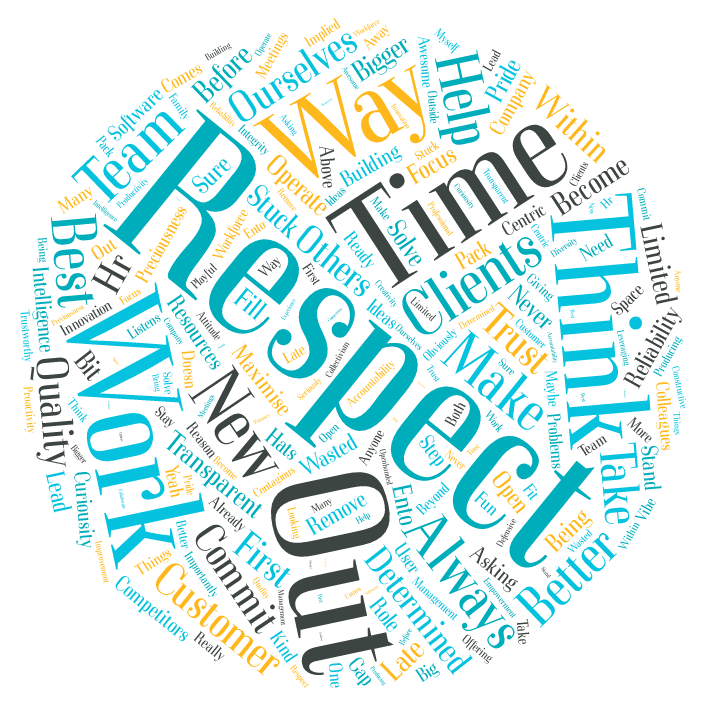 The above image is a word cloud, generated from the responses the Ento team sent through. The bigger the word, the more times it appeared in the responses we collected from the team. Respect features heavily, as do a few other words. Customer. Time. Work. Team. Regardless of position, role or any other defining factor we almost have to operate as a hive mind – with everyone on the same page as much as possible. We take our work seriously, but not ourselves. Fun is a big part of what we do. How am I looking after myself to bring the best me to work? Now that we knew what each individual team member considers to be important, we could start breaking those ideas down into one, all-encompassing ethos that represents all of us. Our next step was to take a more in-depth look at some of the pervasive themes in the feedback we got from our team, and think about how these ideas apply directly to us, in our day-to-day operations. Respect: Respect should underpin everything we do. Respect your colleagues, our clients, yourself, and our shared spaces. Respect the preciousness of time. Respect customers. Keeping respect in our minds at all times will ensure we avoid unpleasant or inappropriate happening in the workplace. Quality: In order to be competitive, we need to ensure that every single thing that every one of us creates is something we can be proud of. Always commit to quality and take pride in your work. ‘Good enough’ should never be an acceptable standard. Improvement: We can’t be the best in our field without making a constant commitment to improving, innovating and growing. Always look for better ways to do things, and never be content with just saying ‘but that’s the way we’ve always done it’. Stay on top of developments and tech that can help us do things better. Integrity: Conduct ourselves with honesty and integrity at all times. The virtuous path is not always the easiest path. At Ento, our values are at the very core of how we do things. That means respecting ourselves, our co-workers, and our customers. That means taking pride in our work, and always looking for better, smarter, more efficient ways to do things. And it means valuing honesty and integrity above all else – because ultimately, we don’t want to be merely good. We want to be the best. Now, there’s nothing exactly wrong with this value statement. It’s just that our core values of respect, integrity, quality and improvement are hardly groundbreaking in any way. Realistically, those four values are things that any smart, ethical and motivated person should value. The realisation that what we’d come up with was fairly standard informed the next step of our process – determining what, exactly, makes Ento’s culture uniquely ours. In order to do that, we needed to ask ourselves the following question. How is Ento different to other workplaces? When you’re trying to assess your own workplace, it can be difficult to do that from a place free of bias. When you’re trying to assess your own workplace by comparing it to other places you’ve worked, it’s practically impossible. We’re friendly. You could maybe chalk it up to our team still being on the small side, but at this stage, at Ento, we’re not embattling microcultures and cliques, and the damaging effects thereof. Everyone is friendly, welcoming and happy to chat to anyone else in the team. It makes working together a hell of alot easier. We take our work, not ourselves, seriously. There’s something of a stigma attached to the idea of ‘not taking things too seriously’ – it tends to speak of a tendency to blow things off. However, at Ento, we tend to take our work seriously, but not ourselves. And that’s really important. We’re switched on. This is a group of people who knows what’s up. Everyone at Ento is plugged in, switched on, and fully aware of new developments, new competitors and new possibilities. It speaks to a genuine interest in the space, and a genuine commitment to the product. We believe in what we’re doing. There’s no sense of simply doing the bare minimum, of phoning it in, of just getting by. Everyone at Ento believes in the product, and in what we’re trying to do. And that makes a world of difference. We can be trusted to do the right thing. Need to leave early one day? That’s cool. Need to come in a bit late? That’s fine too. Every single person at Ento can be trusted to get things done without being micromanaged or babysat. We’re endlessly curious. We are driven by an insatiable need to find new, better ways to do things. To find new, better ways to make life easier for our clients. To find new, better ways to make our product, our services and ourselves the best in the game. We have the courage of our convictions. This is not a team of ‘yes men’. This is a team of people who are not afraid to challenge preconceived notions, and have the conviction to stand by their ideas and beliefs. We’re focused on the product. With more developers than sales, marketing or support staff on our team, we pour far more resources into developing Ento as a product than we do developing Ento as a brand. These are the things that define us at Ento – the traits, idiosyncrasies and ideals that make our culture uniquely ours. These will all need to be reflected in our final cultural statement. Finally, after weeks of analysis and discussion, we’ve come up with a set of values that embody our culture, our beliefs and our motivations. This statement, below, will help guide us as we grow, and ensure we continue to represent the principles and ideals we value. It will enable new employees to understand what we’re about, and help clients get a feel for the type of business they’ll be dealing with. We lead with our mission statement, which is what informs all of our decisions. 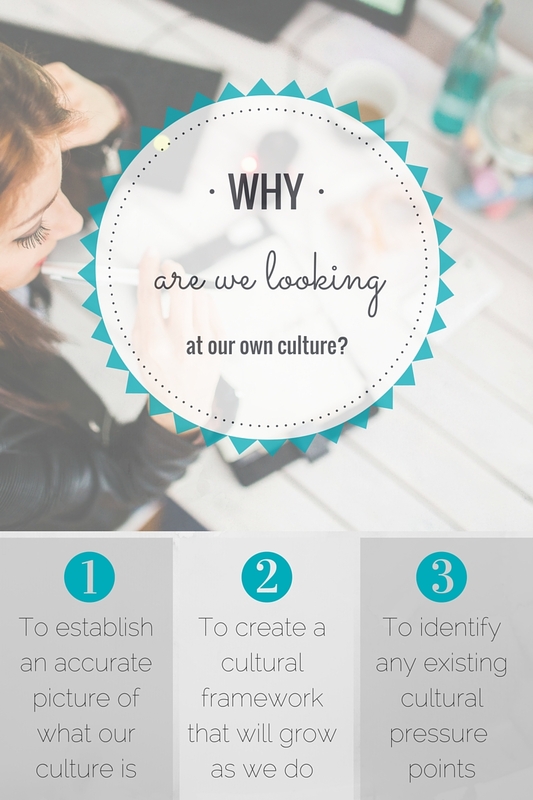 We then move into the ideas and culture that define our people, and our product. It both informs and inspires, and that is exactly what a solid workplace culture should do. Our mission is to take every last minute of wasted time out of HR & workforce management so you can spend more time on what matters most – your people. People are at the very heart of everything Ento creates. We are a team of leaders. A team of thinkers. We are driven by a tireless curiosity, and a constant need to find better, smarter ways to do things. We challenge the status quo, and have the courage of our convictions when we do. We take our work, but not ourselves, seriously. We know that great things happen in happy workplaces, which is why we endeavour to make our workplace one that is fun, respectful and friendly. The product we create is at the very heart of everything Ento achieves. The industry we exist in is inherently complex but the market demands simplicity. Our product team thrives on this challenge by balancing flexibility and power with speed and beauty. The only way we will win is with the best people and the best product. Workplace culture is one of those things that often gets shunted to the side by organisations, for a number of reasons. It’s too difficult. Too amorphous. It’s simply not a priority when compared to other crucial business tasks. But the fact is, ignoring workplace culture can be a costly mistake to make. A positive, managed culture contributes directly to employee engagement, and subsequently, employee performance. For us, the opportunity to define what we believe in, and to be able to create a framework that will guide us as we move forward, has been both rewarding and enlightening. As Ento continues to grow, we can be confident that we have constructed a foundation that will support us at any scale, through any opportunity.